The city of Detroit, from the rise and fall of the auto industry to the riots of 1967 and beyond, has popularly symbolized the twentieth-century American experience more dramatically than nearly any other city in the country. Detroit served as inspiration for artists ranging from Diego Rivera, with his monumental ode to industrial labor in the murals at the Detroit Institute of Arts, to Philip Levine, who captured, in poems like the iconic “They Feed They Lion,” the violent beauty and simmering tensions in the industrial scenes in which Rivera saw so much hope. Angela Flournoy’s debut novel The Turner House, one of the latest literary projects to engage with the history of Detroit and its people, evokes the power, honesty, and critical intelligence of Levine’s work (which forms a part of this book’s epigraph). But unlike Levine, Flournoy approaches her material through the wider lens of fiction, offering readers a harmonious and ultimately reassuring vision of home and familial love. Maybe you could call it the Motown touch. Early reviewers projected The Turner House might well be the next Great American Novel—that elusive, often spurious honorific. Less showy and more focused than that other big Detroit novel, 2003 Pulitzer Prize winner Middlesex by Jeffrey Eugenides, The Turner House cuts to the center of the fractured American dream, imparting a lyrical, memorable, history-in-brief of both the city itself and the larger cultural forces that built it and allowed it to crumble—all reflected through the broken hearts and households of one typical American family, the Turners. The present action of Flournoy’s novel occurs in the summer of 2008, the housing and financial crises of the post–Bush recession in full swing. The Turner family’s eastside neighborhood—once a thriving, aspirational place—is now dotted with empty lots and vacant houses, the type of neighborhood where cars aren’t safe parked out on the street overnight and where, after dark, whole garages are stolen from backyards. The house in which the Turner children—all thirteen of them—spent their most formative years has been deserted ever since the Turner matriarch, Viola, decamped for the suburbs in her declining health. She lives there in the home of her prosperous eldest son Cha-Cha, who has become the de facto head of household following the death of Viola’s husband Francis. Predictably, Cha-Cha faces rivals among his siblings. When the Turners discover that Viola, who was railroaded into a predatory home equity loan a few years back, owes far more money than the house is currently worth, they dissolve into disagreement, some threatening mutiny. Viola, whose mind wanders between doses of her pain medication, insists that the house be kept. She is backed by the more sentimental of her children, including Lelah, her youngest, who is squatting in the deserted house and dealing with a gambling problem, and Troy, who wants to transfer the house to his girlfriend. Cha-Cha favors putting the issue to a family vote, although lately his mind has been elsewhere: he’s lost his job driving a truck for Chrysler, following a serious accident on the road, and he begins to talk of a “haint,” a ghostly presence he felt just before the wreck. The Turner family has a history with haints. One of Flournoy’s gifts, in managing so many characters over a span of nearly seventy years, is presenting backstory in a way that feels utterly natural, like a bit of family lore the reader grew up hearing about. According to one Turner legend, a haint came to Cha-Cha’s window one night in his childhood and tried to pull him out of bed. The rest of his siblings, roused by his screams, later swear that they too saw the haint at the windowsill. As they try to make sense of this event, their skepticism about haints fades, and they accept the turn at more or less face value: “They’d heard plenty of tales of mischievous haints from their cousins Down South—they pushed people into wells, made hanged men dance in midair—so it did not follow that a spirit from the other side would have to spend several minutes fighting off a territorial fourteen-year-old.” Viola tells Cha-Cha of haints that pursued family members back in their home state of Arkansas, and even earlier in Virginia, where Turner ancestors lived in slavery. He was tall and slender without lapsing into frail, and his skin was the color of baked-right cornbread. He’d learned early on that folks assigned all sorts of qualities to skin like his, and that a certain type of middle-aged woman would always consider a yellow boy somehow trustworthy. In Detroit, Francis finds crowded flophouses, backbreaking work, and stark boundaries drawn around neighborhoods where black workers can and cannot live, as well as police who abuse their authority at will. Flournoy dutifully charts the myriad ways black lives were robbed of dignity and pride on a daily basis in Detroit’s past, including a tense, deeply uncomfortable exchange between Francis and two white policemen that is sadly recognizable to contemporary readers. Flournoy weaves a subtle pattern of echoes across generations and decades, showing us that—where racial equality is concerned—less in our society has changed over the past sixty years than some readers might wish to believe. Cha-Cha’s pride, along with his sanity, comes under attack when he starts seeing the haint again, months after his truck accident. In Flournoy’s sympathetic narration, we believe he is seeing something, even if, as his therapist Alice suggests, this something might be a manifestation of a different kind of ghost from the past. The Turner House is strangely, satisfyingly agnostic about the nature and origins of the haint, although Flournoy draws convincing connections between it and the specters of shame, hidden addiction, and unfulfilled yearning that haunt this family at least as much as any phantom. True to this novel’s generosity of spirit, even some haints carry kernels of good. Flournoy ends this family epic on a note of surprising lightness, despite the considerable stakes she has devised for her characters. The things about the world that trouble us most—or that we struggle the most to explain, to others and to ourselves—are not going anywhere anytime soon. Flournoy suggests that strength lies in the families we are born into or seek out ourselves, however stifling they may sometimes feel. The Turners’ feelings for each other pivot “between hard and unwieldy and tender and sincere,” much like the complicated feelings they have for the flawed city and country they call home. They share a spirit of solidarity we can learn from and aspire to—a love I found myself nostalgic for, weeks after reading. Like the junior senator from Chicago whose presidential campaign seems like such a long shot in the summer of 2008, the Turner family, and Flournoy’s masterful novel, allow us to hope. 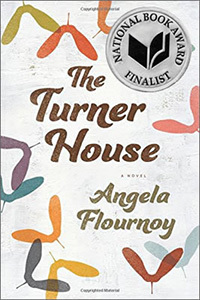 Angela Flournoy’s debut novel is The Turner House (Houghton Mifflin Harcourt, 2015), a New York Times Notable Book of 2015, and a finalist for the National Book Award. Her work has appeared in The Paris Review, The New Republic, The Los Angeles Times, and elsewhere.